This is my first ever Glenglassaugh and I’d be lying if I told you I know much about this distillery. Away to Malt Madness we go! Okay, so now I know that the distillery was mothballed in 1986 by the Edrington Group and then reopened in 2008 by new owners who purchased a lot of new equipment, which means the new spirit is unlikely to be like the old spirit. These new owners have released a few older expressions (from malt made by the previous regime) that have generally been well-received. I wish I could say the same about their own very young release, the Glenglassaugh Revival. While there are some who seem to like it, it made a number of “Worst of the Year” lists when it was released. But that was a 3 yo–who knows what the mature malt will taste like. At any rate, as the whisky I am reviewing today is also from the previous owners, and a different era, it is not going to be any sort of predictor of the quality of the malt currently maturing at Glenglassaugh either. Nose: Ah, quite lovely. Lots of old, polished wood–despite the age, bright, rather than tannic–and wood glue, and also a fair bit of honey and citrus. Then some tart-sweet mango and also a bit of white pepper. Some malt under all of that. Rather intoxicating–I could nose this for a long, long time. A drop of water brings out some darker sweetness–apricot jam, I want to say. Palate: Not much of a letdown here. Rich tropical fruit–mango, pineapple–along with some dried apricot and marmalade. The wood is here too, more peppery and spicy than on the nose, and more integrated with the malt, which seems more roasted. With more time there’s some salt too and a bit of an herbal/rooty twist to the wood. Okay, let’s add some water. As on the nose, darker, sweeter notes with water and the wood gets a little more grip now too. Finish: Short at first with just some of the fruit hanging around. But after the second and third sips it begins to expand, and now there’s a bracing bitter edge which seems like it must be the remnants of the roasted malt and it lingers for a fair bit. Not too much change on the finish with water. Comments: This was rather lovely. My only complaint, and it’s a relatively minor one, is that the mouthfeel is a little thin–just a little more depth/intensity and those lovely flavours would have far more staying power; the finish is too brief as well. It must be said though that, oddly enough, a drop of water seems to intensify rather than dilute this already low’ish abv malt. Funny how that happens–though I’m sure there’s some chemistry explanation. The nose is lovely though. On the whole, rather like some Caperdonichs and Longmorns of similar age and vintage. I’ve aired before my skepticism about the claims of magic years at distilleries like Caperdonich, and I think this is further grist for my mill: it indicates again that the common variable is malt of a similar profile being put into refill casks (and probably American oak) for a very long period of time. Anyway, I wish I could afford a full bottle of this. Does anyone know how consistent/variable Glenglassaugh was in the 1970s? 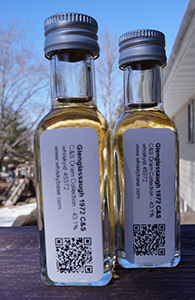 This entry was posted in -Whisky by Rating, 90-94 points, C&S, Glenglassaugh. Bookmark the permalink. Ruben reviewed this recently as well and found very similar notes in it.